Call us to clean your gutters! While we recommend a gutter protection system like our LeavesOut gutter guards to make your gutters virtually maintenance free we are also happy to clean your existing gutters. We clean all types of gutters and downspouts in our Northeast Georgia and the Upstate South Carolina service area. Each year ladder accidents result in countless injuries to homeowners, tall rooflines and surrounding trees may make parts of your roof hard to access properly. In addition, uninsured workers may sue or make a claim against your homeowners insurance if they are injured. 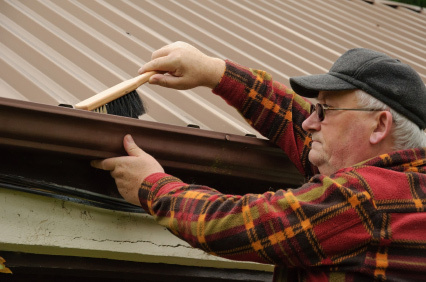 Avoid these hassles and leave your gutter cleaning to the professionals at Southern Gutter Service. Depending on your tree coverage we recommend either an annual cleaning or bi-annual visits to keep your gutters clear. Give us a call for a free estimate.